The PSR dropped below 25% into bearish territory at the point labeled “A.” Over the next several months, the PSR continued to move lower as the public became more and more bullish. During this period, prices surged upward adding to the bullish frenzy. 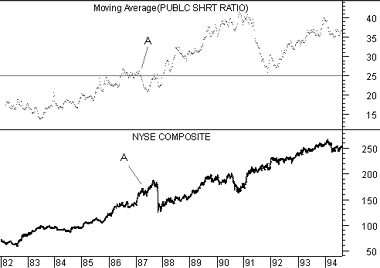 The subsequent crash of 1987 gave the public a strong dose of reality. Since the crash of 1987, the PSR has remained high, telling us that the public doesn’t expect higher prices–a bullish sign.